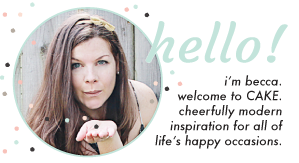 CAKE Creative Co.: fun feature: how does she? First off, let me apologize for the spotty posting. With the onset of some major projects at work and starting to prepare for baby, I’m finding myself spread a bit thin at the moment (so fair warning that I might be a little MIA over the next few weeks). 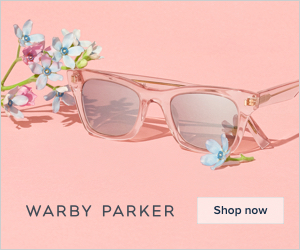 In other, better news... Birthday Girl is being featured on a fabulous website today! I’m so touched by the sweet words about my blog and I’d love for you to check out the post. 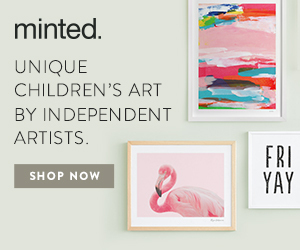 How Does She is run by three talented mothers who share their inspirations and learnings from blogs and other resources. 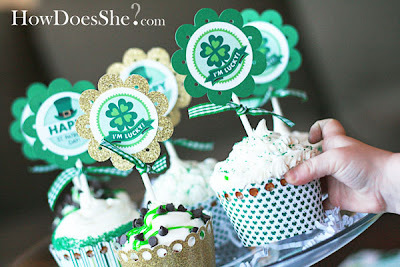 There are some terrific articles to be found on everything from crafting, to parenting, to cooking... including this FREE St Patricks Day cupcake topper & label download. How cute are these? They’d be the perfect accompaniment to this recipe I posted last year for all your St Patrick’s Day festivities. They’ve also got some birthday party features coming soon that I can’t wait to read and share with you. I love the name of this blog! Have a great weekend. Congrats Becca! You deserve it!! Awesome! These are great! Thanks so much for sharing the link! Congratulations on the feature, you deserve it! Love your blog!